A deadly pattern wherever dark buzzers are hatching. 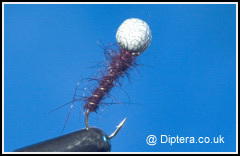 Used on a floating line, the fly is cast out and then either wait for the trout to take the fly, or cover a rise with the fly. Makes an alternative to the CDC buzzer, it works just as effective and is far cheaper. Take a small polystyrene booby ball and encase it tightly in some nylon tight material. Catch this in using the tying thread and cut off excess. Make a tidy thorax with the thread. Catch in some fine gold wire and proceed with the tying thread down to the hook bend, covering the gold wire. Carefully dub a small rope of hares ear all the way up the hook bend until you reach the thorax. Make a tidy rib with the gold wire until the thorax is reached. Secure the gold wire and cut off excess. For the remainder of the thorax dub in some more hares ear, not so tightly as before and cast the thread off at the hook eye.